Spring is a wonderful time to take a drive through the Downtown streets of Wilmington and view the gorgeous trees and bushes in bloom. Attorney Mr. Ronald Carey, whose office is located in a charming building at 283 N. South Street, has a magnificent specimen of the Saucer Magnolia at its finest. 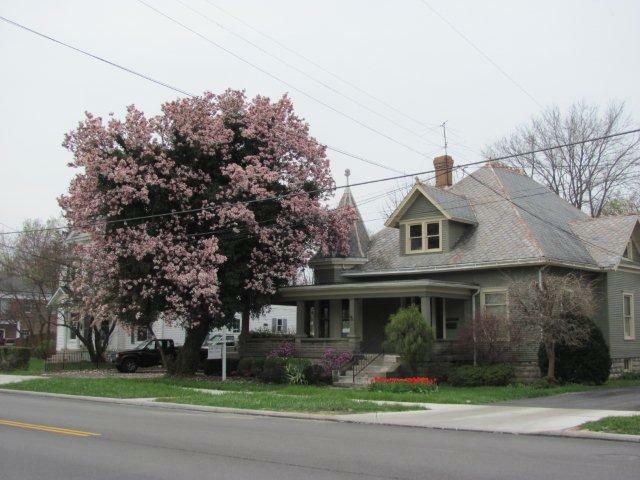 In fact, now is a perfect time to view the whole frontal landscaping of this property which includes contrasting tulips and complimentary azalea bushes. A man-made hybrid between the Chinese Yulan Magnolia and the Lily Magnolia, the Saucer Magnolia’s name was derived from the 17th Century Botanist Pierre Magnol, and “Etienne Soulange-Bodin, who raised the original hybrid of this plant on his plantation in France” according to the internet site “Flower Spy”. Wilmington has demonstrated perfect weather this Spring for showy Saucer Magnolias, which have a tendency to lose early blooms due to frost. Some people choose a northern exposure for this type of lovely ornamental, so as to delay the blooming period long enough so that the danger of frost passes. Conscientious designers plant magnolias on the north side of green pine trees to act as a protective barrier, as well as to create a lush back drop for such gorgeous color. Saucer Magnolias are interestingly pollution tolerant. They prefer moist, deep acidic soil (4.5 - 6), full sun to part shade, and in Zones 4-9, they grow 20 - 30’ tall with a 25’ spread,. Expect an open crown and a medium growth rate. But remember, prune this deciduous tree drastically when young, in order that one single trunk gets established. And should it be required, you may shape the crown, but only after the flowering period has been completed, so as not to inhibit bud growth for next year. Trimming protruding suckers is common, and you might even get a “start” on a new plant that way. The fuzzy buds of the Saucer Magnolia form prior to overwintering. The flowers turn a pinkish-purple color on the outside, while the inside is porcelain white. Touch one of the petals. Its texture is smooth and extremely tactile. The scented blooms can reach 10” across when fully open, and their form resembles that of a saucer, thus its name. Some blooms last 3 weeks, are extremely showy, and are much appreciated by bees, butterflies and birds. 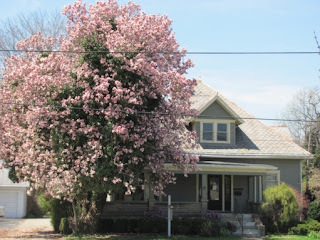 The Saucer Magnolia’s display of glorious color is often short-lived, due to Wilmington’s tendency for high winds, which de-blooms the tree and the delicate petals end up on the ground, creating a slippery mass. The flower buds precede the broad green leaves which end up turning brown in the Fall. Saucer Magnolias can be easily propagated by seed or softwood cuttings, (note: rooting can take up to three months), however, remove the fleshy coating on the seeds, if you wish to store them. Dormant oil can be sprayed onto the silver-grey bark to control scale insects that over-winter, though temperatures must be above freezing in order for the oil to be effective. In some instances during the summer months, hornets can also be a problem. Mulching at the bottom of the tree if encouraged, but do not mulch onto exposed tree roots. If you are considering taking a drive in Downtwon Wilmington to view some of the gorgeous street trees, two other specimens of the Saucer Magnolia can be seen at the corner of S. South Street at Sugartree Street, and there is one inside the Sugar Grove Cemetery on the north east side. Feast your eyes! These are undoubtedly spectacular! Enjoy. If you are interested in contacting the Wilmington Tree Commission or if you would like to purchase a Tribute Tree in memory of a loved one, please e-mail our Secretary at ckrisa@cinci.rr.com.